Plush rose gold make-up videos (by Sara K), stand-up comedy (ladka sakt hai-Zahir khan), and educational content (Khan Academy) ……. Yes, you have seen innumerous videos for music, dance, make-up, lifestyle, weight loss etc. All thanks to the video-learning wave bought by YouTube, imbibed by Facebook and Whatsapp. Videos are a total online marketing game revamper and there is no doubt about the fact that vloggers are minting on it. What is a vlog, you may then ask? It’s a blog in the form of a video, and it’s a important online wave. It is a perfect representation of shift in the reliance of marketers from old age advertising to influencer based marketing. It is a form of marketing where the person in front of the camera is a brand who in turn promotes another brand’s products. 90% of consumers watch videos on their mobile. From Q3 of 2013, mobile video views have grown more than 233 percent. YouTube reports mobile video consumption rises 100% every year. According to Google, smartphone users are twice as likely than TV viewers and 1.4 times more likely as desktop viewers to feel a sense of personal connection to brands that show video content or ads on their devices. 98% of users say they’ve watched an explainer video to learn more about a product or service. That is why 45% of businesses which use video marketing said that they have an explainer video on their home page. Of those businesses, 83% said that their homepage explainer video was effective. Seems interesting right? We at The Hustler Collective, welcome you to another aspect of the Digital World. Be ready to immerse in an in-depth explainer of what it takes to make a vlog and be a YouTube sensation!! How to Set-Up Your First Vlog? Once you unleash your creative side, set a goal and understand your market; it is easy to comprehend the concept and content you want to work upon. The ideation and implementation are two equally important steps and hence it is important to set up a strong base of the idea so that you can build upon it some clutter breaking content. Understanding the right creative approach can be the crucial step in making an effective video. Over the years we at The Hustler Collective have developed a specific process that will help you to make effective concept notes to create content which can be well resonated with the audience out there. Pay Attention to the Problem Statement: Understand what interests you, what appeals you and to what extend it influences you? When you get an answer for the above three what’s, congratulations you have the basis of the story that you want to build!! Brainstorm Ideas to Know What May Work: Getting an idea is great, working on the iterations is important. Why do we say that? Well, if Thomas Edison would not have brainstormed, he would not have got that bulb above your head glow. Review the Creative Notions Set By You: Brainstorming, check? Perfect. Now go for reviewing the whole idea. This will help you to understand your thought process and join it with the target audience. Pick Your Final Idea: We know it seems trivial to go for so many steps, but practice makes a man perfect. The whole idea of reconsidering your ideas is to make sure that you make your journey a long one. You just do not stop at 2-3 videos, you create a channel. The foremost thing that you will need to start a vlog will be a CAMERA!! It is quite obvious that the quality of the camera is prime for making a good vlog but then a crazy-expensive camera is not required for the initial initiation of the blog. Many of the vloggers use a webcam in their computer or even their smartphone. Smartphones now are having amazing camera and technologies and hence are a good rescue for you till the time you monetize your vlog. For “talking head” videos, in which you sit in front of the camera and talk, the story is quite easy to work upon. Your professionalism, which will hopefully keep viewers interested and watching will cover up the need for a very good camera. But once you grip in the market, you may require a better, a professional camera. So, which camera should you purchase? There is no denial to the fact that you can do with a smartphone camera but as your experience and audience grows, it is always good to buy a good camera. To support your camera, you need a tripod which will help you in shooting from a perfect angle and distance. 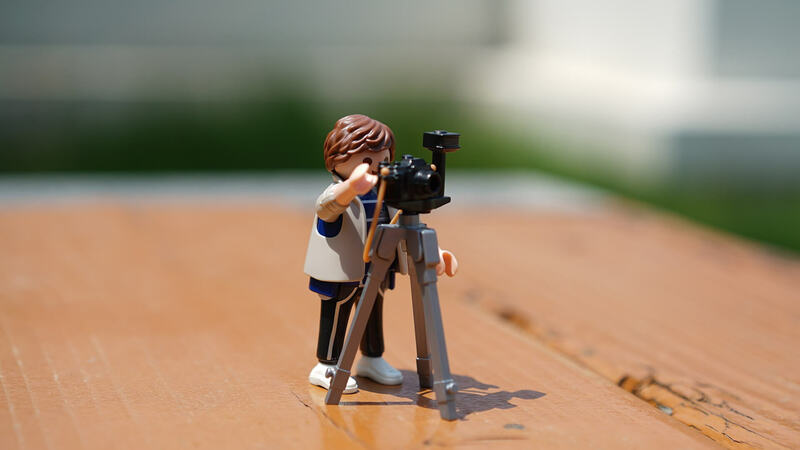 Initially, a basic tripod, maybe second hand or one from extensive range available on Alibaba Express can do but as you grow, you may need more professional equipment, be it the camera or the tripod. So for instance, if your camera is heavier, you may go for tripods like the Magnus VT-4000 or the Benro S4 Head with Aluminum Flip Lock Legs. Or you could go for a Joby GorillaPod for the travel vlogger. A GoPro is a good option if you go for filming videos. Lighting can be a small yet a crucial part for vloggers to decide upon. Too much brightness or darkness can hamper the overall quality of your vlog. So, the light can be subtle but really effective. The whole purpose of perfect lighting is to grab your viewer’s attention on the interesting content that you have build and not to try and spot you in the bright or dark backdrop. We would recommend picking up a basic soft-light kit, say for example Impact Soft n’ Natural Kit. This kit, or any other option with basic features (for starting well), gives you two soft light sources that you can position in front of you (one of either side, with one) to provide your videos the appeal that the viewer desires for. HARISON Quadlux Mark II Single Kit: This kit is an excellent package for portraits, product photography and video shoots. The QuadLux light provides an even and diffused spread. It emits a soft continuous light using compact fluorescent spiral lamps. A 46cm X 46cm soft box is provided with this kit for softening and diffusing the light output. The Harison Minitower Light Stand is also a part of this package. Alternatively, you can use a single large soft light positioned about 45 degrees to the side and slightly higher than your head, while having another one on wall or ceiling to raise the overall lightening effect in the room. A bad audio is a turnoff for any video viewer. The sole and simple reason for that is the breach of the message that was being conveyed by the video. The simplest solution for this problem is to use an external microphone rather than the one built in your laptop or smartphone. So, initially you may scout for basic microphones which have noise cancellation feature. The simplest way to capture better audio is to add a shotgun microphone, which has a highly directional pick-up pattern that is highly sensitive where you point it. The closer you can get the microphone to you, the better. If your camera is going to be placed more than a few feet away from you, then mounting the microphone off-camera is the way to go. And since the microphone isn’t restricted to on-camera use, you can opt for a large, more professional shotgun microphone. If your work is largely like a desk job, you may opt for a UDB microphone which will give the desired quality. It’s particularly effective when you get in use your webcam for making videos. Your task is not yet over with just getting the camera, lighting, and microphone on point, you also need a non-linear editing (NLE) program to cut together your amazing content so that you can deliver the best to the audience you have. Though the basic software for editing are still available in your laptop, you may scout for some other options. If you think all of the above are a bit complicated, you may go for Adobe Premiere Elements or even Apple iMovie when only simple cutting is required. How to Market Your Vlog? Your Audience is your Friend:How would you feel if you meet your best friend and he treats you like any other person?? Awkward? Maybe, bad? Surely. Treat your audience as if you are interacting with them on one on one basis. Talk to them like you made the video for them. This will add a pinch of personal touch to your vlog and people who connect with your agenda, would love to follow you persistently. The need of mentioning this point is immense. Trust us when we say your talent is your USP but it’s marketing that helps you monetize it. Use various mediums to share your content. Make sure that you are not just a vlogger but also an influencer in the long run. Quality Backlinks: Make a blog or a website along with the blog, go for tie-ups with brands who work on the same niche as you. This will help in getting quality backlinks. Video Description: Describe your video really well; this content is never a waste. Use Hashtags: When using handles like twitter, Instagram or Facebook, make sure you use effective hashtagging for a better outreach. (Tip from THC: Take Instagram quite seriously on this). Join Forums: Go for meetups, join online forums, voice your opinions on various mediums for a better online presence and personal brand building. Create High-Quality Content: Be very precise when you reach this point. There are numerous videos on the same topic of how to be an influencer, however Gary Vaynerchuk still has the most top rated videos. This is the power of high in quality content. It lets you capture the market, the audience with minimal extra efforts. The game is all about minting on quality when the world vouches for quantity. Be Authentic: The medium which has the power to make an idea into the next big thing also has the power to have that idea copied. Copying is so easy when there is n-number of resources available to you. But question yourself, who got more marks in the viva? The one who created the project or the one who worked on it? It is very important to keep your content authentic. Your fan following will hence be unique. The power of the digital world lies in the fact that the most famous vloggers earn upto $16.5m (£12.3m). You just need to tab the right idea at the right time and Hey!! Be ready to be the next sensation. You need to understand the essentials that this part of the digital world holds. The basic concept behind this is the power of video, be it vlogs or corporate videos, is that what appeals the eyes, hit the brain better. We at The Hustler Collective recommend you to start building on your digital assets like these for a better brand positioning in the long run.